To begin with, I’d like to mention that I found the 2016 Porsche Panamera to be an attractive vehicle, regardless of what internet naysayers were yammering on about. Having said that, though, I will agree that the designers who overhauled the 2017 Porsche Panamera contoured and tweaked the car in such a way that the model’s looks improved. In order to get a better sense of the changes that the model underwent during the transition from 2016 to 2017, I thought offering a side-by-side comparison of each car might be helpful. I’ll also include some brief commentary in order to highlight some of the stylistic alterations. For a closer view of each comparison, click on any of the images for a larger perspective. For example, one notable alteration can been found in the more angular headlamps. Likewise, an extra tier added to the top of the grill makes for a more intimidating presence. Finally, the lower-set turn signals of the 2016 model have been integrated into the the headlamps of the 2017 version.Much of the Panamera’s fasica remains the same, as one can see from the images above. Having said that, though, there are some marked differences that create a more aggressive and sporty look. Furthermore, the body lines, cut into the side panels of each vehicle, produce different contours. Specifically, the horizontal lines created by the quarter-panel air-vents are less angled, while the upper body line of the 2017 model extends further than the lower body line; these lines were inverted on the 2016 model.Comparing the profile views of the 2016 and 2017 Porsche Panamera offers drivers more notable differences between model years. The primary change manifests in the roof line. The 2017 Porsche Panamera swoops downward more prominently, whereas the 2016 iteration bubbles outward. The newer look creates a much sleeker impression. Finally, the cutaways on the rear end of the 2017 model, which were absent in the 2016 addition, are evident in the profile view. Moreover, designers layered the Porsche name over top of the light, so it becomes a back-lit silhouette when a driver depresses the brake pedal. Conversely, the 2016 model has the Porsche brand and Panamera model inscribed in silver script on the vehicle’s body.The most obvious difference between the rear views of the 2016 Porsche Panamera and the 2017 Porsche Panamera are the tail lights. Whereas the 2016 model uses two, discreet triangular shaped lights, the 2017 model boasts one long light that extends the length of the rear and wraps around the sides of the vehicle. Finally, the new cutaways and less bulbous rear produce by the new roof line create a smoother, more refined boot. Whether you’re in the market for a the 2016 or the 2017 Porsche Panamera, Prestige Imports can provide you with information on either model. You can test drive any number of vehicles by stopping by our dealership, which is located at 9201 West Colfax Avenue between Wadsworth and Kipling. You can also call us at 888.737.1724 to speak with one of our Porsche Brand Ambassadors. Finally, you can also check out our full selection of Panamera models by checking out our online inventory. 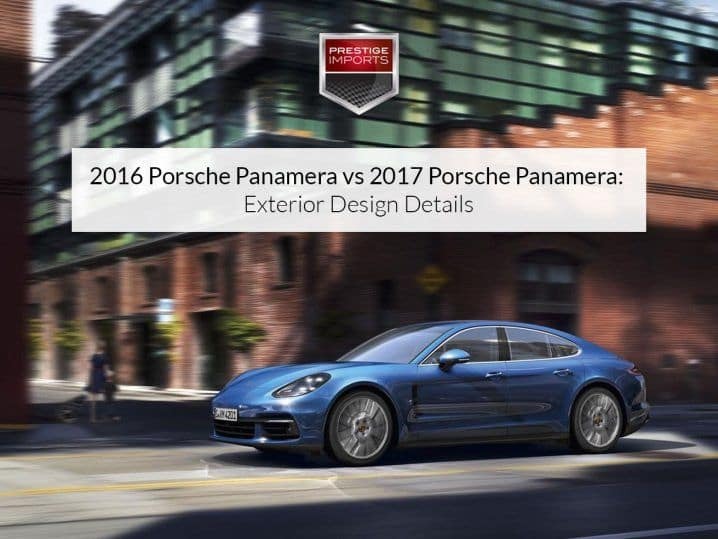 The article “2016 Porsche Panamera vs 2017 Porsche Panamera: Exterior Design Details” originally appeared in the Prestige Imports Learning Center.